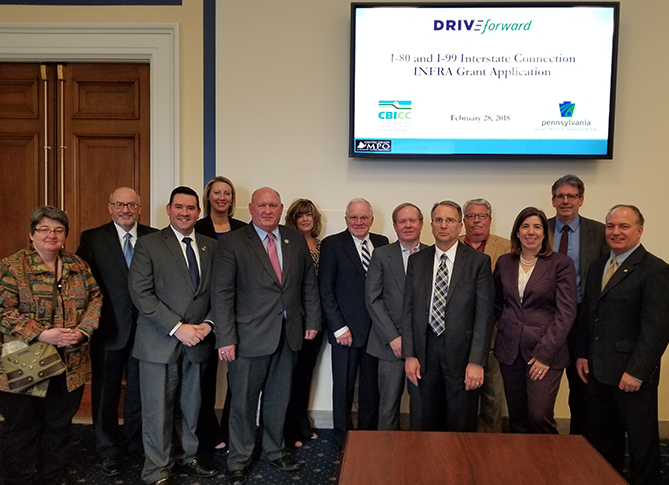 On Wednesday, Feb. 28, 2018, a contingent of business, community and government stakeholders from Centre County and the region traveled to Washington, DC to meet with Congressman Glenn “GT” Thompson, PennDOT Secretary Leslie Richards, and staff from key Pennsylvania congressmen and senators in a show of support for the construction of a high-speed I-99/I-80 interchange and a local access interchange to replace the Bellefonte exit. Participants included representatives from the Chamber of Business & Industry of Centre County; Centre County Metropolitan Planning Organization; Penn State University; state Sen. Jake Corman’s office; state Rep. Mike Hanna’s office; Spring and Marion townships; and private businesses, including Glenn O. Hawbaker, Inc. and Larson Design Group; and state Rep. Kerry Benninghoff. 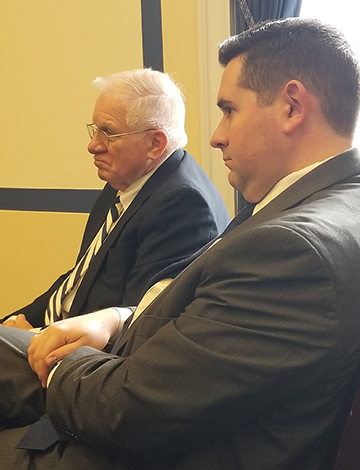 Dan Hawbaker, president and CEO of Glenn O. Hawbaker, Inc., and Matt Wise from state Senate Majority Leader Jake Corman’s office, spoke in support of the interchange project. of the federal grant that would allow the project to move forward if approved. Secretary Richards provided an update on the status of the Infrastructure for Rebuilding America (INFRA) grant application her department submitted to the federal government this past October. The grant application is for the local access interchange that must be constructed first, and that is further along in the design phase. Because the local interchange is further along, the INFRA funding can be obligated and the construction started within specific time frames required by the grant program. However, approval is essential to moving the high-speed interchange project forward. The two projects are linked together. If INFRA funding is approved, then the remaining work on the design and permitting of the high-speed interchange will begin as PennDOT starts and completes the local access interchange. Richards stressed that the interchange is the only project PennDOT submitted for funding through this round of the INFRA program, demonstrating its priority status within the department. Typically, PennDOT would submit multiple projects for funding consideration. About 200 projects nationwide are being considered for INFRA funding. Review of those applications is expected to begin at the end of March, with U.S. Department of Transportation officials noting it takes about 10 hours to review each application. trip to the nation’s capital. 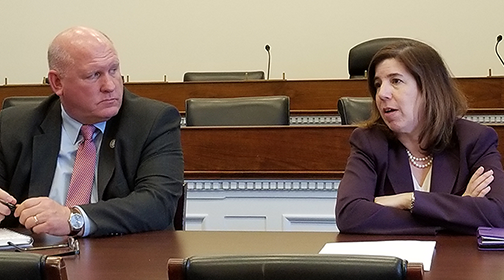 During the meeting, the CBICC presented Congressman Thompson and Secretary Richards with a statement of support that included the signatures of current individual and business ‘DRIVE Forward‘ supporters. A continued show of support is critical. If you have already done so, sign up as a supporter, and stay tuned for additional information on how you can directly lend your voice to the effort to make the high-speed interchange a reality.